Who are the 'star children'? In recent years there has been much written about 'gifted' children with special abilities ('indigo children', 'crystal children', etc.). Such children, it is said, are coming to earth to help humanity in its development. Based on extensive research, Georg KÜhlewind confirms that this new generation has been incarnating among us for the past couple of decades. This event, he states, is one of the most important of our age. We all possess the tools he describes for taking this path: our thoughts, our heart forces and our willpower. By using these faculties with our full attention, by focusing our attentiveness and eliminating everything else, we can enter the realm of the spirit where laws differing from those on earth prevail. The author aids us on this path by closing each chapter with themes for contemplation and meditation. 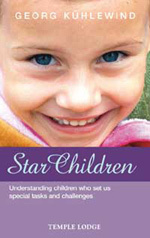 Star Children is a compelling addition to the literature on the theme of 'special' children, and offers a unique perspective based on spiritual-scientific discipline and research. GEORG KÜHLEWIND is the author of 24 books, including From Normal to Healthy and The Life of the Soul. A retired physical chemist, he lives in Hungary and travels the world giving workshops and lectures.